Saturday June 18, 2016 in Toronto — The League of Canadian Poets has chosen poet Bruce Rice as the 2016 winner of the Colleen Thibaudeau Outstanding Contribution Award for his efforts in establishing the Mayor’s Poetry City Challenge. Thanks to Bruce, mayors across Canada can now bring poetry into politics by inviting a poet to read at a council meeting during National Poetry Month. Congratulations Bruce! And thank you, Penn Kemp, London Ontario’s First Poet Laureate and long-time friend of Colleen Thibaudeau, for presenting the award to Bruce — true poeticians all! Past recipients of the Colleen Thibaudeau Award for Outstanding Contribution to Poetry are Glen Sorestead (2015), Allan Briesmaster (2014), Dennis Reid (2013), and Wendy Morton (2012). 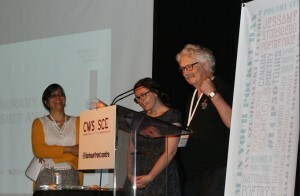 Established in memory of late poet and honorary member Colleen Thibaudeau (1925-2012), the award was created by the League of Canadian Poets and Colleen Thibaudeau’s family to honour and recognize a substantial volunteer project or series of projects that significantly nurture and support poets and poetry across Canada. 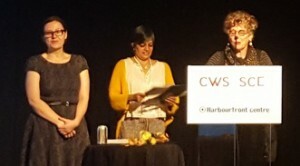 For more about the League of Canadian Poets and this year’s Canadian Writers Summit, see the League’s write-up of the event, “Lorna Crozier is double-winner at 2016 LCP book awards”.